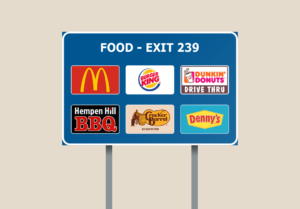 Highway Signs | Kenney Signs, Inc.
Highway signs, also known as Specific Information Business Signs (LOGO), provide identification and directional information near interstates, freeways and expressways for eligible businesses offering gas, food, lodging, camping, 24-hour pharmacies and tourist attractions. 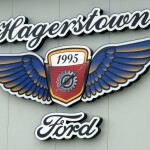 We provide the design for LOGO signs as well as submit drawings for approval to the states of Maryland and West Virginia. Once designs are approved by the state, we ship directly to Maryland State Highway Administration (MDSHA) or West Virginia Department of Highways (WVDOH) for installation. Contact us for a personalized estimate based on your specific needs.